EU Commissioner Pierre Moscovici has said a Greek debt deal is close but needs a "happy ending", as Greek Prime Minister Alexis Tsipras pushes for an agreement in Brussels. After a late-night meeting with French and German leaders, Mr Tsipras said they had decided to intensify talks. He then met European Commission head Jean-Claude Juncker on Thursday. Greece is seeking a cash-for-reform deal, to avoid defaulting on a €1.5bn debt repayment to the IMF. But the EU and IMF are unhappy with the extent of economic reforms the Athens government is offering in exchange for the release of a final €7.2bn (£5.3bn) in bailout funds. The president of Germany's Bundesbank, Jens Weidmann, emphasised that time was running out for a deal, and that "the risk of insolvency is increasing by the day". And ratings agency Standard and Poors pushed Greece's credit rating into junk territory, warning that without a deal it could default on commercial debt within a year. Mr Tsipras's left-wing Syriza party came to power in January on an anti-austerity platform. It fulfilled one of its campaign pledges on Thursday when state broadcaster ERT resumed broadcasts, exactly two years after it was replaced by a smaller-scale operation called Nerit. Nerit's channels were replaced on Thursday by ERT's programming. Greek stocks soared by more than 8% on Thursday, reacting to the positive comments from Brussels - even though there was little obvious progress. Image caption Mr Tsipras said European leaders understood the need for a "viable solution"
Earlier this week, Athens submitted a revised reform plan to the EU and IMF, after Mr Tsipras rejected a set of reforms put forward by Jean-Claude Juncker. It is believed Athens has conceded ground on VAT reforms, pensions and the country's primary surplus target. "We decided to intensify efforts to resolve the differences that remain and to move towards a solution," the Greek prime minister told reporters after his meeting with German Chancellor Angela Merkel and French President Francois Hollande. "The European leaders realised that we must offer a viable solution and the chance for Greece to return to growth," Mr Tsipras added. Mrs Merkel told reporters later they had had a "very intense exchange of views" and that every day counted. Image caption EU Commissioner Pierre Moscovici said talks with Greece were "now ready for landing"
EU Economic Affairs Commissioner Pierre Moscovici told French radio on Thursday that the talks with Greece had progressed in recent weeks to the extent that "we're now ready for landing". "I really like Greek tragedy, but I think now we really have to move on to the happy ending." European Council President Donald Tusk was adamant that next Thursday's meeting of eurozone finance ministers should be decisive and that the time for negotiations was over. "There's no more space for gambling, there's no more time for gambling," he said. 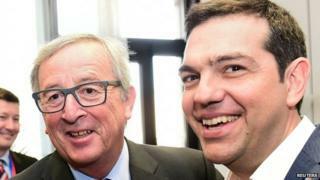 The Greek leader spent two hours with Mr Juncker but they said little to reporters afterwards. A major sticking point in the talks appears to be Mr Tsipras's demand for some debt relief for Greece, the BBC's Damian Grammaticas in Brussels reports. European leaders will not countenance writing off debts before Greece commits to reforms, our correspondent says. Last week, Greece postponed until the end of June a €300m payment to the IMF, deciding to bundle up four payments amounting to €1.5bn. Mr Tsipras has warned that a failure to reach a deal on Greece's bailout by the end of June would be the beginning of the end for the eurozone. Will the ECB play its trump card over Greece's future?